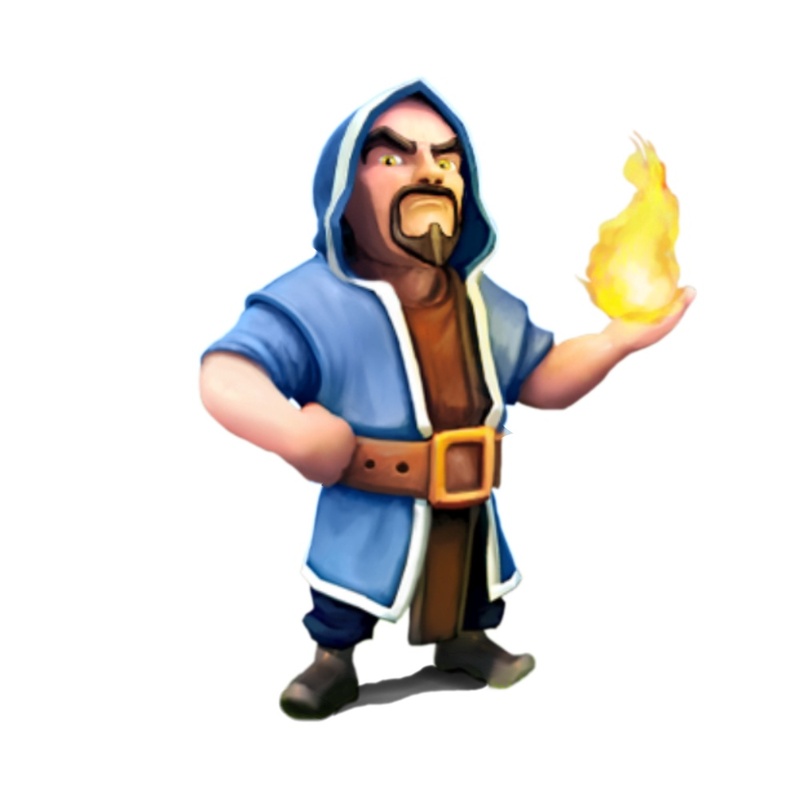 The Wizard is one of many Regular Troops in the Clash of Clans game. The Wizard is a terrifying presence on a battlefield. Pair him up with some of his fellows and cast concentrated blasts of destruction on anything, land or sky! The Wizard is a magical unit that wears a hooded cloak, a leather belt with golden buckle and matching boots. The Wizard is very similar to the Archer in that he uses a ranged attack and can shoot over Walls. He shoots fireballs or energy blasts that do high damage, but requires support as he has relatively low hitpoints and can easily be killed by point defenses. Wizards are commonly used in large groups for fire support or as a force multiplier (similar to Archers), but they can also be effective in smaller numbers, especially at lower levels. Wizards have no preferred target when attacking; they will simply attack the closest building to them. However, once they become aware of enemy Clan Castle troops, Heroes or Skeleton Trap skeletons (either by being attacked themselves or being near another friendly Troop under attack), they will leave their previously targeted building and engage the enemy Troops instead. Once all of the nearby enemy Troops are defeated, they will proceed to attack the nearest building from their current location. Description of common tactics of usage a Wizard on a battlefield is Here. When first unlocked, the Wizard wears a light blue cloak, a black beard, and a brown belt, with a brown tunic underneath. He attacks using fireballs. At level 3, the Wizard’s cloak changes from light blue to purple. His boots become bright purple as well. His tunic also becomes purplish in color. 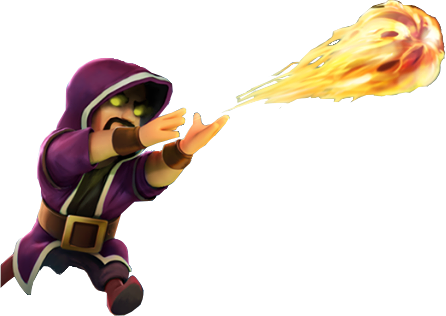 At level 4, the Wizard attacks with purple lightning-like spells instead of fireballs. At level 5, the Wizard’s cloak changes to dark blue, and his boots transition from a purplish color to a blackish color, as well as his tunic. At level 6, the Wizard’s cloak changes to the color red-violet, his belt buckle becomes orange, and his eyes turn a shade of yellow. His boots also change to red-violet. His attacks change to searing orange energy blasts. When you are doing the tutorial, a Villager mentions the reinforcement Wizards of Ivory Tower. However, Ivory Tower is not mentioned again in the future. This could, however, be a reference to the Wizard Tower. Because you get 5 Wizards in the tutorial, they are the first unit that you deploy but NOT the first unlocked for general use, which are Barbarians. You only need to use 2 of the Wizards to finish the tutorial level and save them for future looting, making your opponent see that he was raided by a low level player with Wizards. 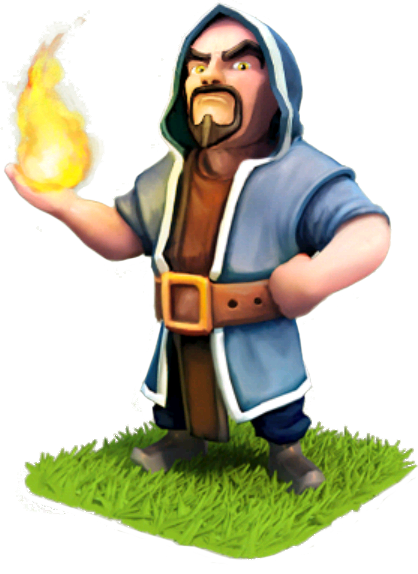 Wizards are often used by high-level players in place of Archers because of their high damage and relatively high health (when compared to Archers that will be killed in a single hit by most high level Defensive Buildings). You can have a maximum of 60 Wizards at one time in a complete set of fully upgraded Army Camps. This number increases to 68 if you include the 8 that can fit into a fully upgraded Clan Castle. Along with the level 5 and 6 Wall Breaker, the Wizard is the only unit in the game capable of killing itself in one shot. In fact, once a Wizard reaches level 4, it can kill even a max-level Wizard in one shot. 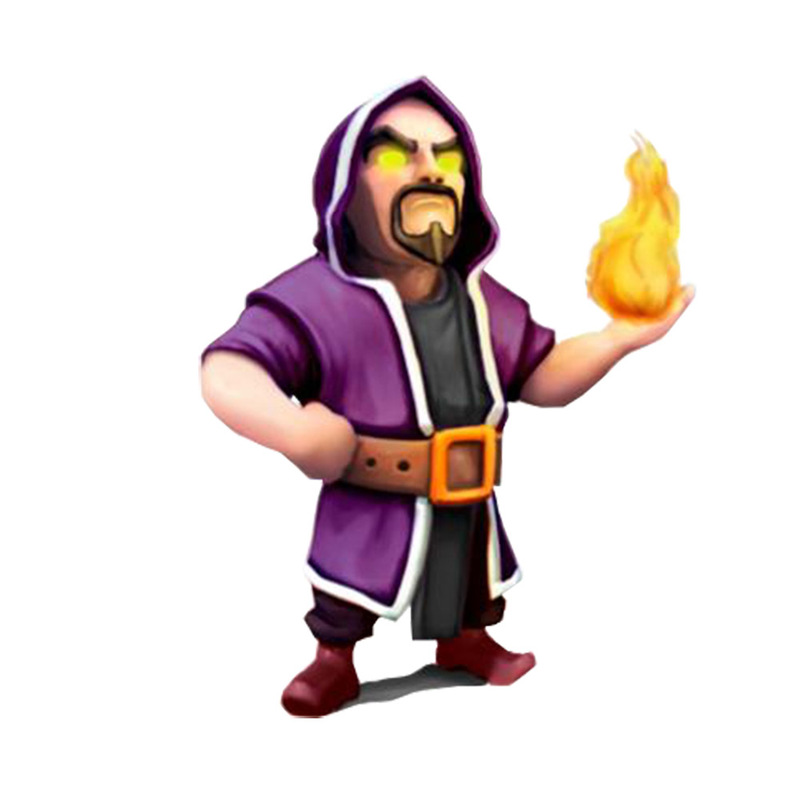 On a per-housing space basis, the Wizard has the highest damage per second of any Troop by a small margin (45 damage per housing space at level 6, slightly ahead of the second-place level 6 Goblin at 42). This excludes the damage multipliers of Goblins and Wall Breakers to certain buildings. In the application package of the game, the sound effect file refers to the wizard as ‘mage’. 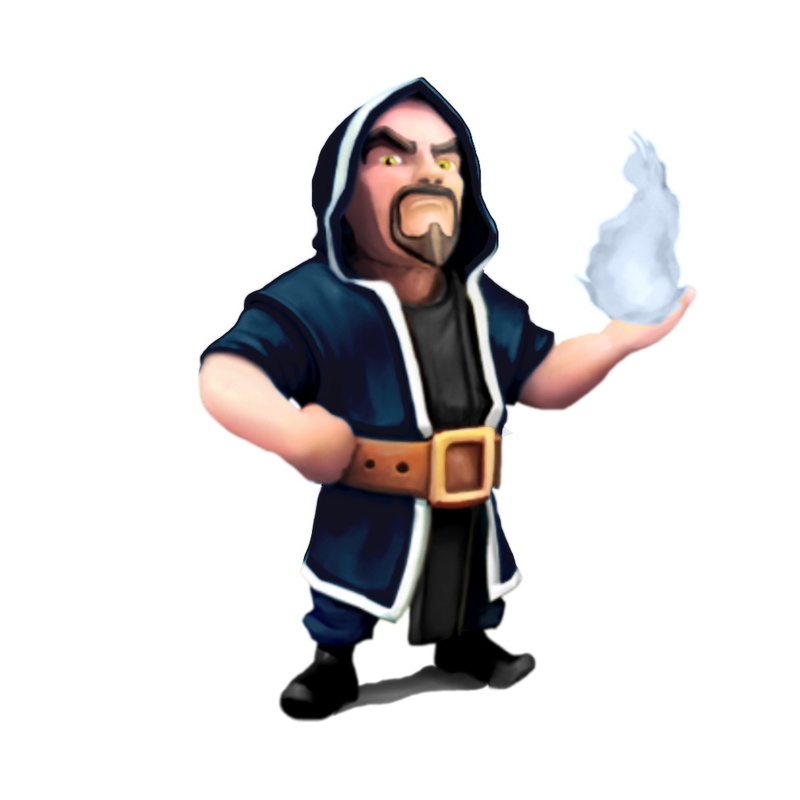 On August 28, 2014, Supercell hosted an event where the training cost and time of the Wizard were reduced by half for a limited time. 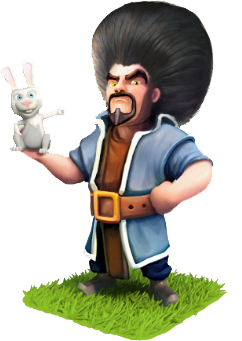 During this event, the image of the Wizard in the Barracks showed the wizard with his hair in an afro and the fireball in his left hand was replaced with a rabbit. The silhouette of the wizard in the battle results screen and the laboratory screen also had the same changes. The image refers to the Clash of Clans commercial, featuring the wizard. As of the 12 March 2013 update, the Wizard’s attack now has a splash component. This increases their effectiveness against lower-health Troops such as Goblins, Archers and Barbarians as Clan Castle Troops. You can hear “HAZZAH!” every time an individual Wizard attacks. This also may refer to which he casts his spells. Want more loot? Join a League and get a Loot Bonus for every successful attack!